The NIPS facility is located at the end position of the neutron guide No.10/1. It is designed mostly for large-sample PGAA, as well as for position-resolved element analysis with Prompt-Gamma Activation Imaging (PGAI). From the cold neutron-source of the Budapest Research Reactor, the neutrons are guided to the experimental positions by the same curved neutron guides as for the PGAA facility. 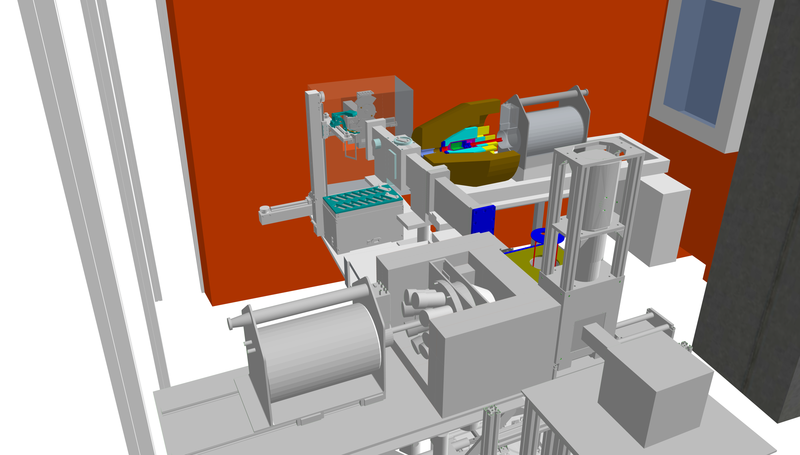 Before the beam enters to the experimental area, the beam is divided into two sub-beams (upper and lower) by suitable collimators, and the lower one operates the NIPS facility. 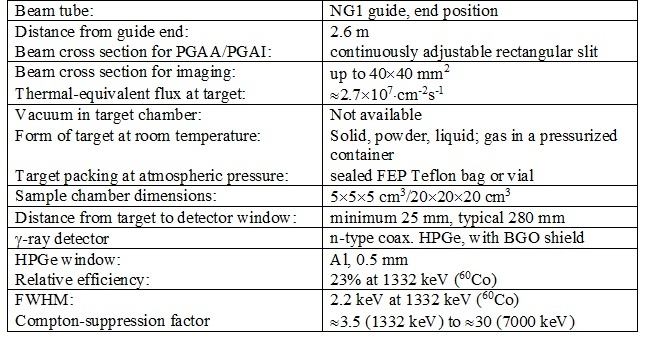 The thermal-equivalent neutron flux at the NIPS sample positions is 2.7×107 cm–2 s–1. The beam could be collimated to a maximum cross-section of 4×4 cm2. The intensity of the incoming neutron flux is monitored and recorded with an ORDELA Model 4511 N neutron detector throughout the whole reactor campaign. The beam arrives through a flight tube of 5×5 cm2 cross section. A sample chamber with dimensions of 20×20×20 cm3 is available for large-sample PGAA and position-sensitive applications. It is made of AlMgSi alloy, and lined from inside with 6Li-enriched polymer. By removing one or more side panels, larger objects up to 5 kg weight could also be analyzed (such as a sword, vase, stones, etc.). Samples can be loaded manually from the top, or placed onto an XYZω motorized sample stage with a travel distance of 200 mm and a guaranteed precision of 15 μm, which is introduced from the bottom. If custom devices are to be built into the beam, a short flight tube without a sample chamber is the proper choice. An n-type coaxial HPGe detector (Canberra GR 2318/S) equipped with a Scionix BGO Compton suppressor is used for the routine prompt gamma measurements. This latter can accommodate HPGe detectors with larger crystals (up to end cap diameter of 76 mm). The passive shielding is made of standard lead bricks in a thickness of 10 cm for each direction. A changeable gamma collimator system is available for PGAI measurements consisting of three different lead collimators with an opening of 30 mm in diameter, a 2×20 mm2 slit and a 5×5 mm2, respectively. The gamma detector systems are regularly calibrated for counting efficiency and non-linearity. This procedure results in a precision of about 0.5% for the relative efficiency curve, 1% for the absolute efficiency curve and a precision of 0.005-0.1 keV for energy determination of peaks. The complex g-ray spectra are evaluated with the spectroscopy program Hypermet-PC. Optionally a Low-energy Germanium detector (LEGe) can be installed within the BGO for high-resolution measurement of few-hundred-keV gammas, best applicable to the analysis of metals. A digital signal processor combined with an Ethernet-based multichannel analyzer module (Canberra AIM 556B) collects the counts. Alternatively, a four-channel, all-digital XIA Pixie 4 spectrometer can also be used. A user-friendly facility control program, “Budapest PGAA-NIPS Data Acquisition Software”, has been written for manual, semi-automatic, and unattended automatic batch measurements. It controls the beam shutters, slits, the motorized sample stage and the gamma acquisition. Figure 1. The configuration of the NIPS experimental station. The coupled NORMA imaging station can be used for radiography-driven local element analysis.